As you may have noticed most of my blogs revolve around food. Forgive me, it's just that I've always been both a big-time consumer and sadly a big-time eater. Today I thought of some scrumptious memories involving foods we're no longer able to indulge in ... I Googled a bit to see if images or info exist and was surprised to discover videos, photos and old ads from the deliciousness of days gone by. 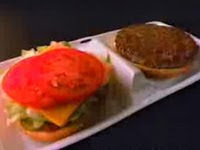 Remember the McDLT (McDonald's Lettuce and Tomato)? I'm not gonna lie. I've always been a sucker for the latest food fad. How could you resist the concept of "the cold on one side" and "the hot on the other." The nifty dual packaging and open-faced burger presentation fooled me into thinking the McDLT was more of a "real burger" than a "rat burger" as my dad so lovingly called Mickey D's meat. Who could forget McDonald's attempt at a lean cheeseburger? With 91% lean meat and less calories than a Quarter Pounder, it was somewhat acceptable to order. I am really bummed that it's gone. Why are dieters forced to order salads or grilled chicken sandwiches? If I'm home and we want ground beef without massive guilt, we can slap a 93% lean burger on the grill. What happened McDonald's? I was also a fan of the McRib until one summer night around 1982. I became violently ill somewhere in the hallway between my bedroom and the bathroom. I will never forget the stench of cheap BBQ sauce that lingered for days. Mom as you may recall, was anti sugar cereal and apparently so was my paternal grandmother. 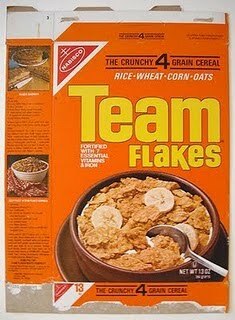 I learned to love the mom-approved cereals like Rice Krispies, Corn Flakes and Raisin Bran but one cereal my grandma always served us when we slept over was TEAM Flakes. I remember reading the back of the orange box (recipes for TEAM flake chicken, etc.) while savoring the famous four grains flavors -- corn, rice, oats and wheat. Something about this cereal was so addicting, my grandma would often let me take a box home with us. Maybe it was hard to find on Long Island since we didn't have ShopRite which is where she always bought it. Again, I was sucked in by interesting packaging. I clearly remember the knitted stitching on this soft baked batch. It reminded me of a "Home Sweet Home" sign that hung in a family members' house - which is exactly the vibe package art was intended to conjure up. A feeling of family and old fashioned times when moms had time to freshly bake chocolate chip or oatmeal cookies. Said to have hit shelves around 1969, I don't remember this product until the mid '80s. It was the prettiest jello I had ever seen. It featured three different layers - one was transparent another was fluffier and the top was creamy. Today there are many different recipes available to create it yourself at home, but I'm sure it won't match the store-bought version, no longer available. I remember making boxes of this growing up and thinking it was such a fancy dessert. I found a Jello 1-2-3 petition online. I wonder if I should call Kraft and urge them to re-release the old favorite. "Time to make the doughnuts" was a slogan we kids loved, but the pretty pink boxes and idea of donuts for breakfast must have caught my attention in high school which is when this silly idea for a cereal hit shelves. I loved the sugary cereal and by that point I earned my own money and Mom had long forgotten her "no sugar cereal" policy. ALMOST HOME COOKIES. Loved those. My fave was the chocolate, chocolate chip. They were the best 'cause they had just the right amount of chemicals to keep 'em good and soft for 50 years – give or take a decade. I remember all of these! that Jello was amazing and I had forgotten about it completely. I would eat a layer at a time. Thanks for the memories! I do remember the McDLT - I think that I ordered it once. Our family was more a Burger King and Roy Rogers one though. Don't remember the other stuff, although that cookie package seems vaguely familiar. I don't think I ever saw the DLT! I remember most of these. I never knew that dunkin donuts made cereal but I remember the rest. I used to love to make that jello!!!!!! What a trip down memory lane. We must be around the same age. 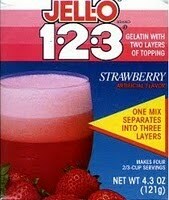 I loved jello 123, it was like a science experiment. I'm sad to learn I also never knew there was a Dunkin' Donuts Cereal! I knew my childhood was lacking something important. The only ones I remember are all the McD's burgers (good marketing, McD's) and the Jello. I wish there were some leaner options at McDonald's these days - other than a salad, obvs. If you ate all of that stuff on a daily, regular basis, you'd be dead by 45. These foods brought back a lot of memories! Do you remember Jason Alexander was on the McDLT? Clearly I grew up in too many different countries. I don't remember ANY of those. Either that, or I was a seriously deprived child. I totally remember both those McDogfood burgers. I fell for the whole McDLT thing, too. I do not remember any of those...except the McDLT and the McLean. I really liked the McDLT. You made me hungry now. I'm too young to remember any of those products. That jell-o looks good but I will only eat it if I see Bill Cosby in a commercial with it. He is ALWAYS talking about the MCDLT... me, now that shows the age difference, i never heard of it!